Those ravioli look as tired as I feel. The sauce was on the sparse side. They look sad. 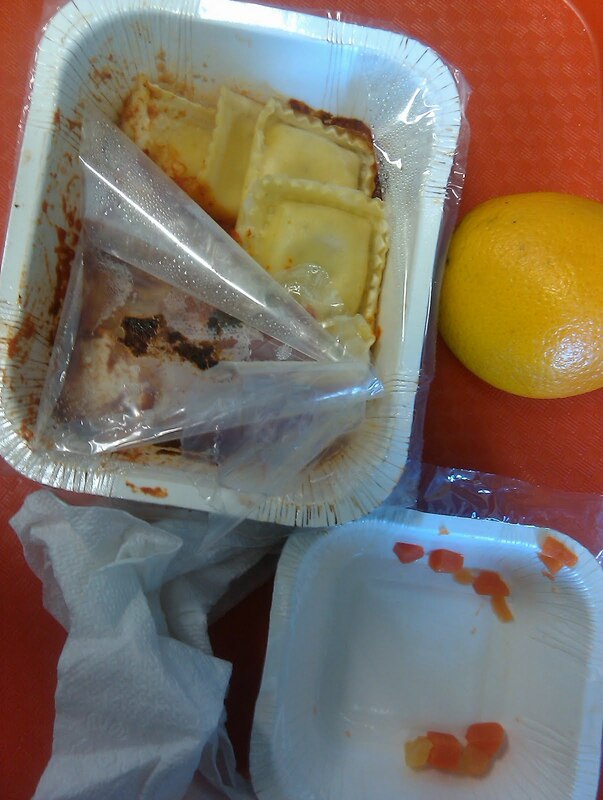 I don’t know how many kids took the ravioli but I have seen kids tell the lunch lady “I’m vegetarian.” I couldn’t make myself eat them. 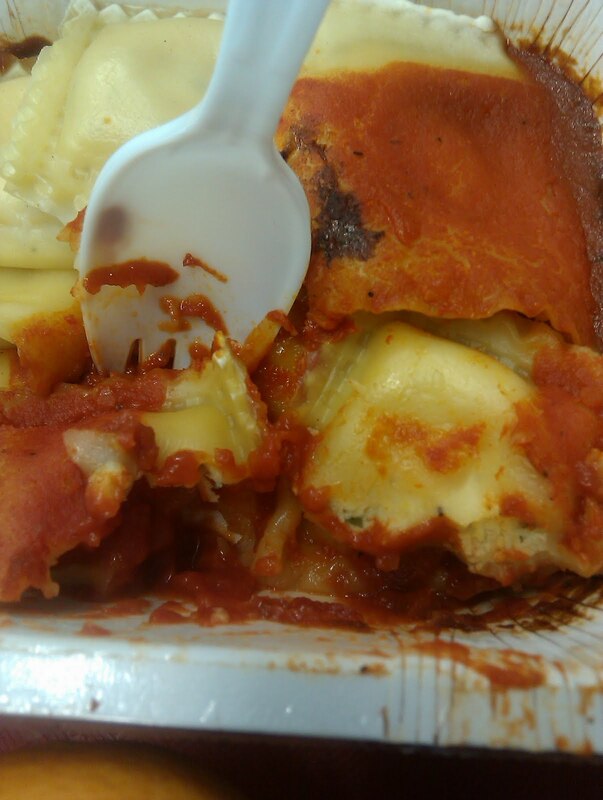 They weren’t as bad as the cheese lasagna, but they weren’t the best either. The carrots tasted great because they were nice and hot and they slid right down my throat. I enjoy hot food. I took my slice of bread and smeared peanut butter on it (I keep a jar in my stash) and ate it. That’s probably cheating, but I couldn’t eat just carrots and a slice of bread and survive the day. It’s days like this I think the kids would appreciate a regular peanut butter and jelly sandwich. Now if we could get that orange sliced up, the kids would get a chance to actually eat it. ﻿I told another friend about this project. I’m slowly bringing people into the fold little by little, but I have to admit that I’m telling more people and getting more fearless. Remember when I paralyzed with fear? It still happens, but I’m getting to the point where I’m more comfortable meshing my online identity with my real life one. I’m going to own this and it’s a good thing. It’s fun to tell people my “recap” (reference to Larry David on Curb — one of my favorite shows). Guess what? Did you hear about that anonymous teacher eating school lunch every day? It’s me! So far none of my friends have said they heard about me. That’s good, I think. Anyway then I say the rest of it that loyal readers already know. I was on Good Morning America. I talked to Jamie Oliver on the phone and I’m chatting with the big guys in school food reform. I spoke at the Mayo Clinic. I know! My friend today was shocked and then did a little happy dance. “I’ve got goose bumps!” she exclaimed and then said, “There’s no way I would have ever suspected it was you.” Hee, hee. How fun!! Next week I’m going to BlogHer Food to speak on a panel. I’m excited about it and I can’t wait to chat more in depth about these issues. There’s going to be a photo/video ban. If you are going to the conference, I’m looking forward to meeting you. No pictures though! Don’t worry, I’m quite ordinary so you are welcome to tweet descriptions of me! Previous PostDay 116: pasta (and a "superhero")Next PostOpen thread: Titanium Spork Award for September — Nominations? But why make REGULAR peanut butter and jelly for kids when there's Smuckers' Uncrustables! I thought you wer overreacting a bit to be afraid that people would find out who you were and that you might be fired. My friend and I have a Facebook page "Bring Healthier School Lunches to Tacoma Public Schools"
Now that the cooks and other staff know who I am, they are not happy with me. The cooks were told that all we do is slam the food and cooks. Well, apparently they don't actually read the page. Because we rarely actually "slam" the food. And we NEVER slam the cooks. Have any of your friends/acquaintances been established readers of your blog so far? I think it would be really interesting to have a conversation about this blog with someone who doesn't know it's you –and hard to keep it secret at that point! It would be fun to have a friend say "you know that blog you've been reading? That's me". Weird, but cool. 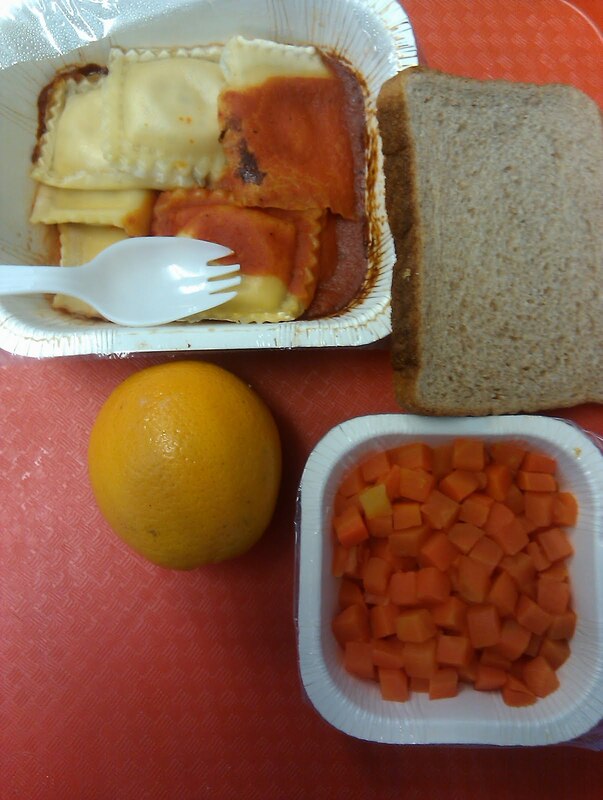 I found it interesting that we had ravioli this week, too. Ours, however, was drowning in a greasy looking sauce. Our oranges are always sliced. Unfortunately, that often means the kids don't take a whole serving of the fruit. I'm glad you are able to supplement with peanut butter but kids aren't that lucky. If they have lunches where they don't have a choice they will eat, they will go hungry. You are doing a great job. Your friends and family should be proud of what you are doing. I hope that more of them will be supportive as they find out who you are and what you've been dong. 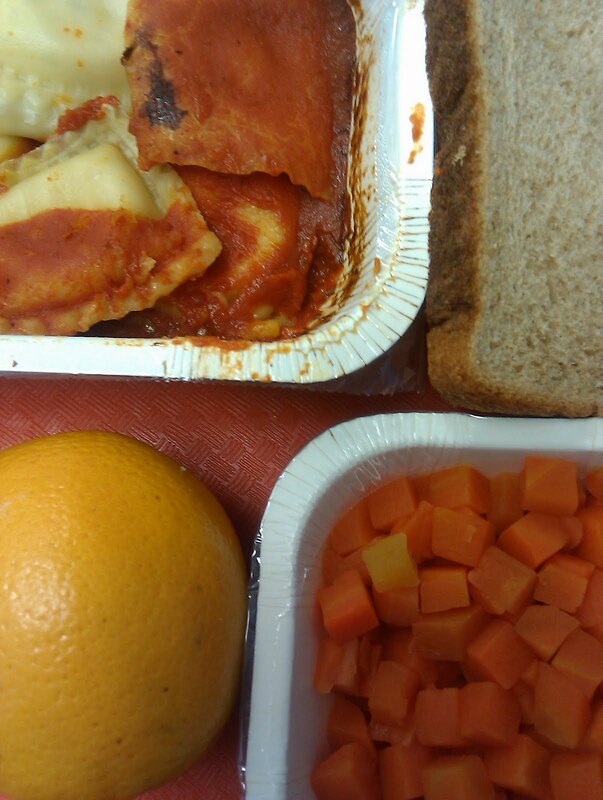 Okay this week here from what I saw on your blog, you and the kids had Sloppy Joes, Pizza, Pasta and Ravioli…. has the school heard of variety? Having a sandwich bar wouldn't involve any cooking. I wonder if it would ever be possible to start one at your school? Or just offer some PB&J and whole wheat bread as a daily option. I realize there are allergy issues that could pose problems, though. I've been following your blog for a couple months now. After seeing the food that your school serves, I decided to eat lunch with my son (1st grade and first child in school). The fruit was fresh and the vegetables appeared to be frozen then steamed. The chicken was a decent quality processed patty. Because we qualify for reduced lunch, I have been letting him eat lunch there if he chooses. But about half the time he wants home lunch, which I can actually get the cost to as low as .40-.60. Fresh fruit, sandwich, pudding, or yogurt, milk (I add flavor, but less sugar than packaged flavored milk). I'm sorry that you have to eat the lunch food everyday, but I appreciate the project you are doing. It has made me want to be more proactive in what my son eats for lunch. I love the idea of a sandwich bar! Sounds great to me! Thanks again for all of your insightful comments. I read every one of them and they perk me up! Craving a PB&J sandwich now — I know what I'm having for lunch tomorrow! I love the school lunch at my school. There are always 3 choices of entree ranging from cheese pizza on wheat bread, bean and cheese burritos, fish sticks, chicken nuggets, hamburgers, chicken sandwiches, ravioli, ham and cheese sandwiches, etc (all baked); and depending on the day, the salad bar contains various items, from raw veggies ranging from jicama, carrots, celery, and broccoli; a dinner roll, frozen strawberries or sliced oranges; yogurt, trailmix and non-fat dressings. The food is always fresh, and tastes so healthy. The kids can take as much or as little as they want from the bar, and everything from the trays to the utensils are compostable at this super green school. I've been a reader for a while, but I don't remember if you've mentioned this or not-is your school not peanut free? I go into schools in my area for part of my work, and I can't think of one that doesn't have a "peanut free zone" sign somewhere. I am so glad you are starting to own your extremely accomplished blog (although I totally understand the paranoia and fear you've soldiered through this year) !!! I was curious about your school's "Nut Policy" too. I'm not sure how a sandwich bar would be an improvement? What would you put on there – peanut butter (high alergen)? Jelly (unless you buy good, i.e. expensive stuff, it's just pretty much fruit flavored high fructose corn syrup)? Cold cuts (high sodium, highly processed, nitrites)? Cheese (sliced cheese is probably expensive in terms of school food budgets)? And then what about the bread? Real, whole grain bread w/o HFCS again ups the cost. A sandwich bar could be just having a variety of different pre-made sandwiches, especially at the elementary school age. There could be PB&J, ham/turkey and cheese, tuna fish, some with veggies, and some without. I would imagine after a couple weeks of having something like that a school would have a pretty good idea of what was popular with kids and what wasn't. I wish there had been a sandwich option in my schools growing up. The only time I ever bought a school lunch was when we went on field trips and that's because it was a PB sandwich. I wasn't much into hot food at lunch time then and still prefer a sandwich even today. Ahh… okay. The premade sandwich bar makes more sense. I was thinking an assemble-yourself bar. Actually, that premade sandwich bar is a great idea… Mrs. Q. mentioned that the cafeteria equipment is lacking, but you don't need stoves or ovens or high-tech equipment to make a heap of sandwiches. On road trips, I've been known to make them on truck tailgates using a napkin and a single cafeteria butterknife. If they got popular enough, maybe the school could invest in an industrial-sized panini press and make hot, grilled sammies in the winter. I can just imagine the pile of piping hot sandwiches stuffed with eggplant and tomato on a cold day. Talk about comfort food!